This entry was posted in death, dying, fear of death, thanatophobia and tagged afterlife, anxiety, anxiety disorders, death, dying, fear of death, fear of the unknown, thanatophobia by luckyotter. Bookmark the permalink. I heard a funny song on TV one time. It went “everyone wants to go to Heaven but nobody wants to die.” LOL! About Jehovah’s Witnesses, I saw an article in Watchtower that said the flames of hell fire came from the flames of the cremation grounds. Makes sense, eh? Living in an assisted living center really puts one in mind of our mortality. You know, I think death is the greatest gift us mortals possess. You talk about the pain and terror of the process of dying. But, without death, suffering could be endless, Eternal. Well, that’s hell, isn’t it? But in “Interview With the Vampire,” a vampire is locked in a metal coffin and entombed inside a brick wall. The fact that he couldn’t die, is what makes this so horrible. Colleen Stan, “the girl in the box,” who was looked in a box her kidnapper kept under his bed, must have taken comfort in knowing that if she were never rescued, she would at last be freed by death. (She did get free.) Personally, I don’t think anyone deserves to go to hell. We are finite beings. Our “sins” are also finite. The most heinous crime is finite in nature so how can anyone deserve hell? If there is a god and he is good and loving, he can’t be less merciful than I am. Interesting post. 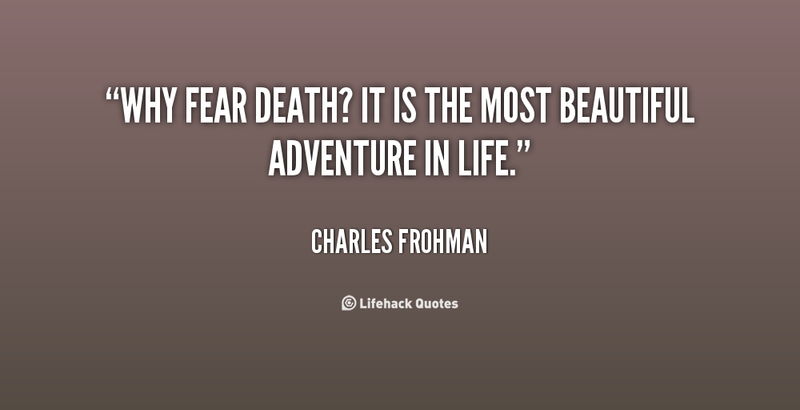 I’m still left wondering, why are you afraid of death? You ask ‘how do you come to terms…”. I’ll tell you how I do, I basically ignore it. There’s really nothing I can do about it, I won’t know for sure anything about it til it happens, so why worry about it? I’ll live life as best as I can and whatever happens when I die, then it happens, so what? I’ll be dead then. I’m also in my 50s now, I don’t figure on living more than another 30 yrs tops! I might be a little afraid of how I die, I don’t want to wind up a vegetable! But I’m not really afraid of what happens after. I’m more afraid of what happens before that. I hate it, but I’ve started to turn into an old fart and worry about all kinds of things I never used to when I was young. I want to travel again. I want to see and do everything I can before I get too old, or get sick and die. Instead I’m wasting my life worrying about not having enough financially to do all those things I want. 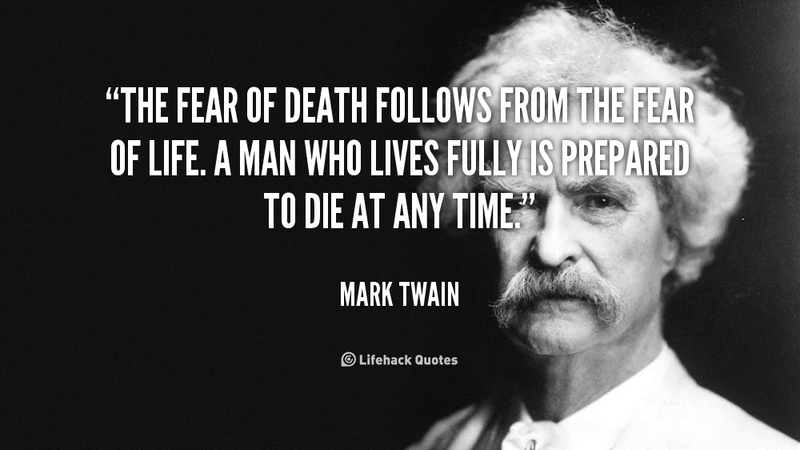 I’d much rather be afraid of death than of life! You’re right. The only thing you can do is not worry and live life to the fullest that you can because there’s nothing you can do to avoid it anyway! I’d love to travel too…if only I had the money to. Maybe I will someday. I hope you get around to it sooner. There’s nothing like traveling to change your life. I’ve always worried too much. I’m just going to have to get to the point of saying the HELL with it all! I don’t have the money either, but if I could just stop worrying about all the bad things, the lack of money wouldn’t really be an issue. There are plenty of ways to travel without much money, you just have to be willing to take the risks. It’s been a long time since i’ve been comfortable enough to travel that way. Worrying about something that may never happen is like paying interest on a debt you may never owe. Hmmm, I doubt that I won’t ever die. 😉 But yes in general this is correct. very true, I need to STOP, wish I knew how to do that. Because you want to die hence the lack of fear? I found out people poop when they die and it bothers the heck out of me! All I could think of is OH! When I die I be pooping in my pants! I’ve heard that too. Ewwwww!